An old book, my copy is dated 1979, and as such doesn’t cover the recent missing persons cases but still details a few interesting cases. My biggest issue with this book is that many of the cases are skimmed over and some are just anecdotes without any searchable or verfiable information. It seems like a compliation of newspaper reports – remember this is before the internet. However, on page 72 it all suddenly gets a little more interesting. It’s about a privately funded Project Magnet which details ‘areas of reduced binding’ where aircraft and their contents are suddenly ripped apart and disappear. One of which areas is located near Bermuda. Sounds familiar? This theory was not backed up by any official sources nor has anyone been able to replicate the results. The instrument he used to determine these areas of reduced binding was his own invention and there’s no detail of exactly how it worked. I do like the theory on the same page by Dr John Harder that the earth is a ‘cosmic zoo’ and disappearances are ‘sample checks’ by our keepers. No more wacky than some other equally unprovable theories. 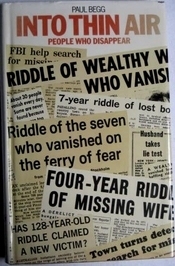 The biggest issue with this book is that the cases are so old (50+ yrs ) and as such predate many of the more ‘novel’ theories regarding disappearances that it may as well be regarded as a novelty given the recent upsurge in interest in missing people as the theories at the time limited themselves to abductions, runaways or Bermuda Triangle type areas. There’s a chapter on the Mary Celeste and the book goes in to great detail about this well-known case. Ultimately I think that the crew either got access to the cargo of commercial alchohol and went mad or a nearby water spout messed with their soundings, they thought they were sinking and the pressure differential blew the hatches open and the crew abandoned ship – or maybe both things are true. A drunken crew got too close to a waterspout, hatches blew open and they jumped overboard in fright only to drown. We shall never know exactly what happened. In summary, the book is outdated, the cases are not investigated in great detail and it seem to be a collation of newspaper reports rather than original research by the author. Useful as a reference guide for the enthusiastic M411 fan but not much more. Buy it to fill a space in your missing persons library.